Add unique detailing to the wall or backsplash in your kitchen or bathroom with the Jeffrey Court Caribbean Water Gloss Glass Wall Tile. The tile pairs beautifully with other complementary stone or ceramic field tiles to create a dramatic effect that coordinates with any decor scheme. Perfect for upgrades and renovations, this 1 sq. ft. pack is designed for indoor use to lend elegance, personal charm and added value to your home. 1 square foot per pack; 8 pieces per pack. Pack weight is 4 lb. Buy online Jeffrey Court Caribbean Water Gloss 3 in. x 6 in. 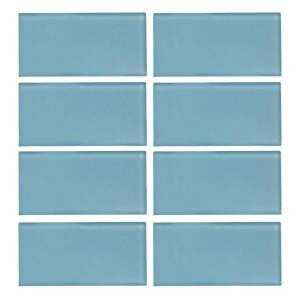 x 8 mm Glass Wall Tile 99514, leave review and share Your friends.